Layla alone knows the truth that will save Xcor's life. But revealing his sacrifice and his hidden heritage will expose them both and destroy everything Layla holds dear -- even her role of mother to her precious young. Torn between love and loyalty, she must summon the courage to stand up against the only family she has for the only man she will ever love. Yet even if Xcor is somehow granted a reprieve, he and Layla would have to confront a graver challenge: bridging the chasm that divides their worlds without paving the way for a future of even greater war, desolation, and death. 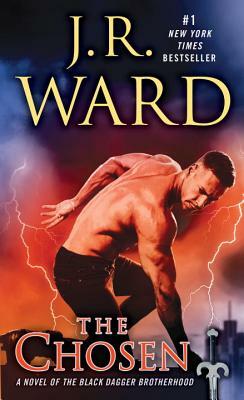 The Chosen is the fifteenth book in the popular Black Dagger Brotherhood series by American author, J.R. Ward. Qhuinn is worried that Chosen Layla, the mother of his twins, has post-natal depression. But when he finds out what’s really bothering her, he loses it, in a major way. He says and does a lot of things that wreak havoc with his two main relationships. And then releasing his rage on the Brotherhood’s captive does not turn out quite as expected. Xcor’s captivity and near death have him recalling his early life, thus giving the reader the backstory on this enigmatic character. Meanwhile, Layla is frantic about the prospect of losing access to her son and daughter, but accepts Wrath’s ruling. Is Vishous showing a soft side? Or is it just a trick? And is he serious about that other matter? Blay’s shock at Qhuinn’s heated words end in drastic action. As well as the main action in the lives of Layla and Xcor, it seems that a certain Band of Bastards ex-member survived the fire with his ambitions for the throne intact. Still in mourning for his Chosen Selena, lost to a horrific disease and now in the Fade, Trez Latimer is stunned and confused when he encounters a prospective employee at his brother, iAm’s restaurant. This instalment has attracted mixed reviews, but with fantasy it pays to remember that the rules of the world the author has created are hers alone and if you don’t like where the story goes, you stop reading. In this instalment, there is a bit less of the banter between the characters that is usually a source of humour, and Lassiter, in particular, is noticeable by his absence for much of the book. But it’s obvious that J.R. Ward had a bit of fun with this one. A very addictive series.